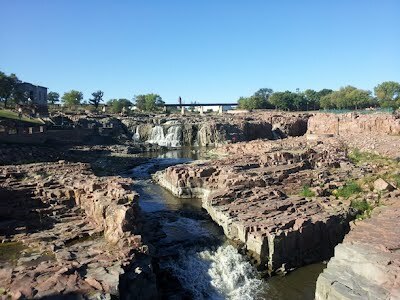 After a short trip through Sioux Falls we arrived at the waterfalls the town is known and named for. We pulled up to a beautiful park with rolling lush green hills leading down to the river, everywhere in the park were huge outcroppings of rocks. There were walking and biking paths all over the park. It just so happened that the time of year that we visited Falls Park, the water level was really low; not surprising after a record drought the year before. After a look around this massive, beautiful park, we quickly decided to make our way to the river’s edge. Knowing we may not be back in this area for years, I just had to get pictures of the lil one sticking the feets in the cold, chilly waters of Sioux Falls. With the water levels down it wasn’t hard to hopscotch across the individual falls to explore all the pools created. After exploring every one of the Falls that we could easily get to, we began the hike around the park to see what else it had to offer. Across the river, there was an old hydraulic plant turned café, being the off season for tourist, it was closed. Just next to this was the Queen Bee Mill, long ago closed, but a beautiful structure in itself. Our next stop in the park was the five story viewing tower and visitor center, as we glanced around we saw a busload of kids running toward the entrance. Me being me, I quickly closed the elevator doors to beat them to the top, there was no way I was going to be locked in an elevator with 10 screaming kids that weren’t ours. 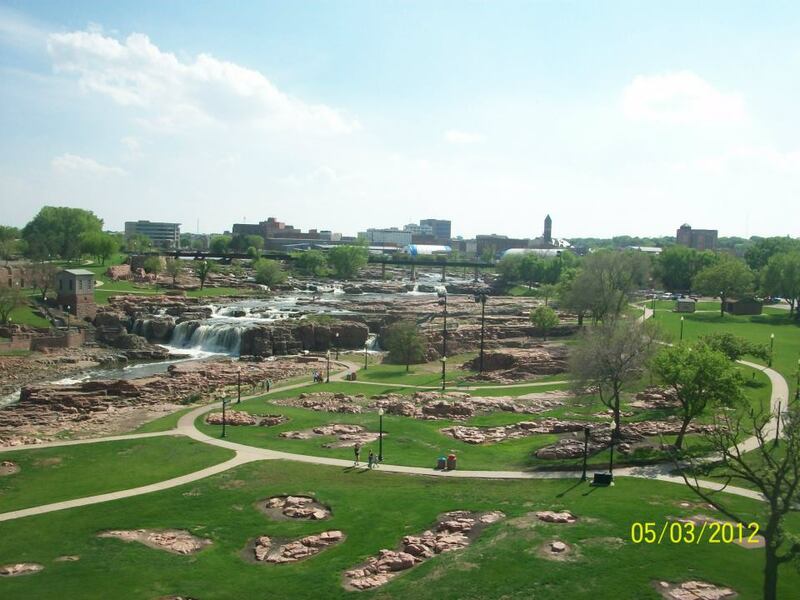 Upon exiting the elevator we were met with a 360˚ view of Falls Park that was absolutely breathtaking. 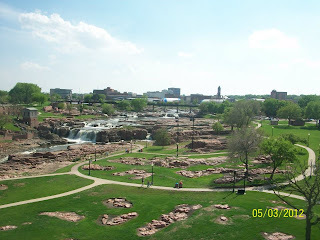 Imagine gentle rolling slopes with the greenest grass, a few beautiful rocks placed here and there; not to mention the meandering Big Sioux River cascading over multiple waterfalls. In my eyes it is one of many gorgeous sites placed here by our Creator. We went back down by the stairs this time, the lil one’s choice, and stopped in at the gift shop. If you know me, you know I’m a sucker for a clearance rack; and they had one! The lil one and I both found souvenirs, a stuffed husky pup and a Sioux Falls T-shirt. After talking with the sweet ladies running the shop we found out that they offered a free trolley ride through downtown. Free!! Yep we were in line for that. The trolley driver was very knowledgeable about the town and area, we even got a history lesson as we waited, the lil one soaking up every word. We only had a few minutes to wait and we were off on another adventure. The ride was pleasant, a little bumpy; I’ve found that in the colder climates it is a lot harder to keep the roadways maintained. They have bronze statues EVERYWHERE we’ve been, not really understanding why at the moment but they are neat to look at. If you take the time to read each plaque attached you will actually learn a few things along the way. There was even a building named after the lil one, had the first name we chose right on the side of the building; of course we had to point this out, boy did that bring out a smile. Before we knew it, it was time to get back to the fifth wheel and prepare our meal for the evening, take the dog out, showers and some quiet time. Knowing that we may not be back for a few years I’m glad we got to see the highlights and stick our toes in Sioux Falls. It turned out to be a very relaxing weekend before hitting the road again, this time headed from the east of SD to the west side of the state; Rapid City and the Black Hills being our next destination.